A plant's genome is the full complement of inherited genetic information. Within this set of instructions, individual genes are being discovered that control critical traits with breeding applications. As new discoveries are made, we will describe them in short summary articles as “Jewels in the Genome" (Iezzoni, 2010). This article reviews the tomato green flesh mutant phenotype and its genetic basis. The underlying cause for the rusty-red to dark purple coloration in tomato has been a very interesting topic of research in recent years. 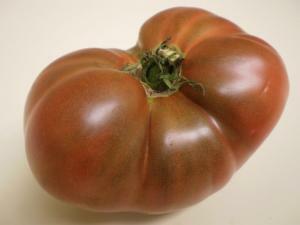 Unlike many other red- to purple-colored fruits that contain anthocyanins, these brown- to black-colored tomatoes have not been found to contain significant levels of anthocyanins (Mes et al., 2008). In red-fleshed tomatoes, ripening produces a color change from green to red due to the transition of chloroplasts into chromoplasts. This transition consists of the degradation of chlorophyll-containing thylakoid membranes within chloroplasts and the accumulation of lycopene pigments. Thus, as the chlorophyll and the complicated thylakoids disappear, the green chloroplasts become simpler pigment-storing chromoplasts (Cheung et al., 1993). Interestingly, some tomato varieties retain chlorophyll in their plastids even as lycopene increases through the ripening process. This combination of red lycopene and green chlorophyll provide these tomato fruit with unique rusty-red to brown or even purple/black appearances (Figs. 1, 2). Tomato lines with these fruit colorations are known as green-flesh (gf) mutants. Park et al. (2007) described the staygreen (SGR) gene in rice that encoded a chloroplast protein regulating the degradation of chlorophyll during senescence. Barry et al. 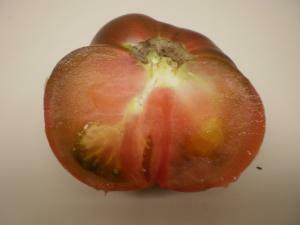 (2008) identified a similar tomato mutation resulting in altered protein function and reduced chlorophyll degradation. Figures 1 and 2. Photographs of "Cherokee Purple" tomatoes illustrate the presence of chlorophyll while the fruit is accumulating lycopene-forming a rusty-red color on the fruit. Photo credit: Natalie Bumgarner, The Ohio State University. The discovery of the specific location of the gf mutation opened the door for further work involving tomatoes that display stay-green characteristics during ripening. Several heirloom tomato varieties exhibit these stay-green phenotypes. These varieties are currently valued for their interesting physical appearance and as a potential source of important traits which would be introgressed into modern cultivated varieties. Barry and Pandey (2009) undertook analysis of the green-flesh locus of twenty-six different heirloom varieties containing characteristics of a stay-green phenotype (gf). Their GF genome sequence is available at GenBank under the accession number FJ647188. DNA from young leaves was excised and a 2.55 kb green flesh gene fragment was amplified using Polymerase Chain Reaction (PCR). The GF genomic clone was then isolated and an A→T mutation located at nucleotide position 1,789 within the clone exon 3 was found, through sequence analysis, to be the gf mutant allele. To carry out genotyping of the different heirloom varieties, the researchers amplified and sequenced a 304 bp fragment that surrounded the mutant allele identified above. Interestingly, this analysis revealed that only eight of the twenty-six selected varieties contained the previously identified A→T point mutation described as the gf mutant allele. This finding led the researchers to assume that other alleles of gf must exist or that other loci were involved in the observed stay-green phenotypes. Further analysis by Barry and Pandy (2009) indeed found additional alleles responsible for this phenotype (Table 1). The variety Black Plum was found to have an A insertion at nucleotide 1,768 that led to an early stop codon and this allele was designated gf2. Ten varieties also presented a 2 bp deletion and the mutated allele was designated as allele gf3. Sequence analysis of a 424 bp fragment of three varieties found a single nucleotide polymorphism (SNP) resulting in another early stop codon and led to the designation of gf4. Only three varieties remained that did not demonstrate one of the above described alleles, and these varieties were found to contain a 1,163 bp deletion designated as gf5. Table 1. Primers and mutation locations for the novel "gf" alleles described in Barry and Pandy (2009). The results of this work clearly show the interesting array of mutations in these studied heirloom tomato varieties that prevent the activity of proteins that cause chlorophyll breakdown. The incomplete understanding of the origination and history of these tomato lines is also of interest. Although it is not yet possible to clearly delineate the lineage of these tomato varieties, relationships among them in terms of the color of the fruit and the genotype can be seen in the genetic analysis reported by Barry and Pandy (2009). Another interesting point discussed by these researchers is the opportunity for manipulation of the history and origin of these heirloom tomatoes for the sake of marketing. The relationships between varieties studied in this research tend to disprove some lore connected to named heirloom varieties and their reported history. Marketing and sales aside, the increasing knowledge of the alleles involved in stay green tomato phenotypes will assist in breeding advancements as the genetic variation in these heirloom varieties becomes available for incorporation into commercial varieties. Barry, C. S., R. P. McQuinn, M. Y. Chung, A. Besuden, and J. J. Giovannoni. 2008. Amino acid substitutions in homologs of the STAY-GREEN protein are responsible for the green-flesh and chlorophyll retainer mutations of tomato and pepper. Plant Physiology 147: 179–187. (Available online at: http://dx.doi.org/10.1104/pp.108.118430) (verified 24 mar 2012). Barry, C. S., and P. Pandey. 2009. A survey of cultivated heirloom tomato varieties identifies four new mutant alleles at the green-flesh locus. Molecular Breeding 24: 269–276. (Available online at: http://dx.doi.org/10.1007/s11032-009-9289-4) (verified 24 Mar 2012). Cheung A. Y., T. McNellis, and B. Piekos. 1993. Maintenance of chloroplast components during chromoplast differentiation in the tomato mutant green flesh. Plant Physiology 101: 1223–1229. (Available online at: http://www.jstor.org/stable/4275102) (verified 24 Mar 2012). Iezzoni, A. 2010. Jewels in the Genome. RosBREED Newsletter 1(1): 9. (Available online at: http://rosbreed.s3.amazonaws.com/wp-content/uploads/2010/10/2010-02_RosBREED.Newsletter.pdf) (verified 24 Mar 2012). Mes, P. J., P. Boches, J. R. Myers, and R. Durst. 2008. Characterization of tomatoes expressing anthocyanin in the fruit. Journal of the American Society for Horticultural Science 133: 262–269. (Available online at: http://journal.ashspublications.org/cgi/content/abstract/133/2/262) (verified 24 Mar 2012. Park, S. Y., J. W. Yu, J. S. Park, J. Li, S. C. Yoo, N. Y. Lee, S. K. Lee, S. W. Jeong, H. S. Seo, H. J. Koh, J. S. Jeon, Y. Park, and N. C. Paek. 2007. The senescence-induced staygreen protein regulates chlorophyll degradation. The Plant Cell 19: 1649–1664. (Available online at: http://www.jstor.org/stable/20077046) (verified 24 Mar 2012).